Did you know the Adams family was buried in Paris?! Just kidding, of course, but I couldn't help smiling when I came across this grave in the Montparnasse cemetery this morning. What was I doing there? I just happened to drive by it on my way to work and thought it could be a nice place to take a photo. 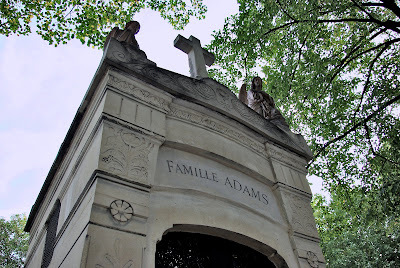 The Montparnasse cemetery is not as famous as Le Père Lachaise but it's a great place to visit if you want to see the grave of famous people, and not just the Adams Family! Hey, Eric, maybe you can enlighten me about the sign in my photo here. What an incredible tomb. I had no idea that "Adams" was a French name. I always associated it with English for some reason. But then, Adam and Eve, I guess that no-one really lays claim to them do they? Perhaps Uncle Fester is really buried in there! Does it glow in the dark? Such an appropriate posting for "Wednesday." The Addams family would be right at home here. But, what with the spelling, there might be an ownership dispute. Wait a minute. I think someone's at the door. "You rang?" Let me try that again two octaves lower. ta-ta-ta-dum-snap-snap, ta-ta-ta-dum-snap-snap (for more, click here. I like the way you photographed this photo, Eric. You could have chosen to do it in black and white, obviously, but I really prefer it like this. French cemetaries are interesting places to visit. My favorite gravesite in Paris is the one where the husband and his wife are in bed together under the covers (all in bronze, now green). What a sense of humor that guy had. I can't remember which cemetary it's at, but definitely worth a visit. That was really funny and made me laugh as well!! Many people don't know that the Addams Family was a comic in the New Yorker long before it got a run on TV! Too funny!! Gotta love Morticia!! I believe Marguerite Duras is also buried there...I am reading L'Amant right now...Oh la la!! Also...Kiki of Montparnasse!!! Oh la la la!!! Oooh how scary! Bet you didn't stay around long. Great photo Eric. Good to be back here, i've missed you! Eric, love your point of view for this photo. Are you old enough to remember that show!? This is my family name, and as a child I was taunted with "da da da dum snap snap, da da da dum snap snap, da da da dum da da da dum da da da dum snap snap. 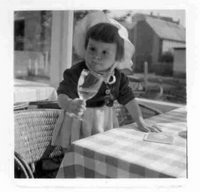 . ." Recently five female members of my family took a trip together to Victoria, BC, Canada. And we found ourselves laughing through the streets singing that little tune and snapping our fingers. That was funny ... One the few laughs I received on the October 1st theme day.